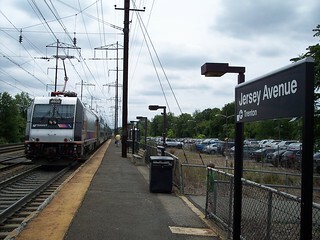 The Jersey Avenue station is unusual in that it lacks a platform on the New York bound side of the tracks. 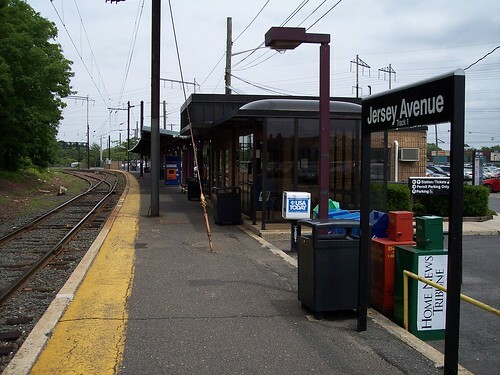 Instead it has a low level platform on the Trenton bound side of the tracks, and another platform and small station building on a spur track. 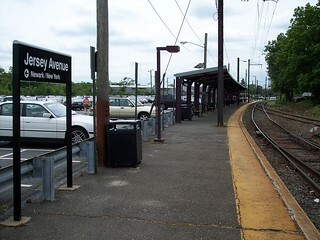 As a result, a small number of trains originate or terminate here on weekdays, and the only New York bound trains serving the station originate here. The station is not served at all on weekends. The photo above is of the platform and station on the spur track. 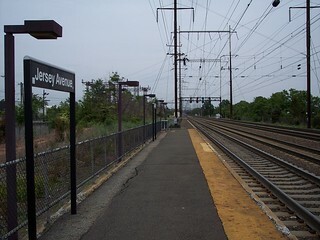 We took a short ride from New Brunswick to Jersey Avenue to visit the station. On the Northeast Corridor, our train from New Brunswick departs for Trenton. The photo on the right looks back toward New Brunswick. Another look at the platform on the spur track.